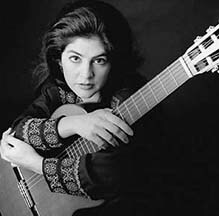 Guitarist Lily Afshar, hailed by the Washington Post as "remarkable, impeccable," is head of the guitar program at the University of Memphis. Chosen as Artistic Ambassador to Africa for the United States Information Agency, her numerous awards include three consecutive annual "Premier Guitarist" awards from the Memphis Chapter of the National Academy of Recording Arts & Sciences. Her latest CD, "Jug of Wine and Thou", is absolutely delightful. The effects of her delicate strokes of the guitar can only be described as heavenly. Among the19 tracks are five popular Persian ballads which indeed create the perfect mood for a jug of wine and thou.